When I was a child, I was terrified of polio. Even more, I feared the diseases vivid icon: the iron lung. I still remember my horror at the thought of being encased in metal looking at the world through an angled mirror installed above my head. I was an early recipient of the vaccine, and stopped fearing polio while still quite young. 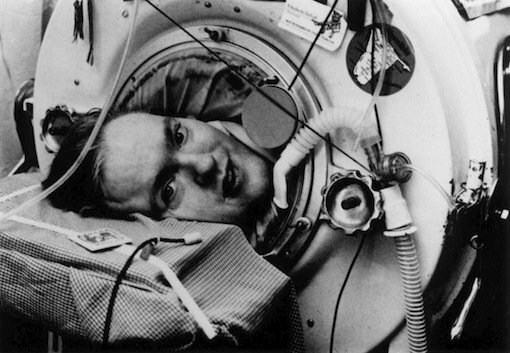 But I never fully lost my iron lung queasiness”which was why I was nervous one July day in 1996 as I knocked on the door of the Berkeley apartment of an anti-assisted suicide activist I was to interview . The mans name was Mark OBrien. Only a month younger than me, he had contracted polio in 1955 and spent the rest of his life living my childhood nightmare. We would soon become fast friends. My first impression on entering was the rhythmic whoosh-whoosh-whoosh of the large yellow machine that dominated the living room. But the lung soon ceased to matter. Mark gave me a dazzling smile and we were soon immersed deeply in conversation. His voice was gravelly, his mind sharp, his wit quick. I was impressed that he was reading Shakespeare. Mark gave a facial shrug. Television irritated his eyes, he said, so he read voraciously using a wand held by his astonishingly prehensile tongue to turn the pages, a tool he also employed to write on a computer strategically placed near his head. Marks true yearning was not for regular access to sexual release but for full inclusion in a society too often indifferent to the common humanity of its disabled members. Indeed, his personal calling was to wage all-out war against societys tendency to isolate the disabled and, concomitantly, to demand respect , that simple but indispensable mutual acknowledgment that we owe each other as equals. His pursuit of the cause started early in a youthful rebellions against autocratic staff in nursing homes. (His rollicking tales reminded me of One Flew Over the Cuckoos Nest .) It continued in the physical ordeal of attending of UC Berkeley while fully quadriplegic. ( Breathing Lessons includes clips taken by news crews of Mark driving himself to school on the citys sidewalks lying supine on a motorized gurney.) It flowered in his long career as a journalist, disability rights activist, and poet, arguing vehemently on behalf of the independent living movement that had liberated him to live in his own apartment, cared for by a personal attendant that he hired”and could fire. By the time I met Mark, post-polio syndrome had sapped most of his remaining physical vitality. He was terrified of leaving the womb of the machine, but still would defy polio to make occasional personal appearances. For example, he made a triumphant presentation at a Berkeley screening of Breathing Lessons I attended, even taking questions from the audience (at the cost of significant exhaustion). One of the last times I saw Mark, he was arguing with a physician. A power outage and the failure of his redundant electrical system had landed him in the hospital from near suffocation. The doctor wanted to discharge him, but Mark wasnt ready. When I walked in, the doctor turned away from Mark and started talking to me. Mark read him the riot act, and he soon received the extra time he thought he needed to be able to return safely home. They say life is what you make of it. By this and any measurement, Mark triumphed. His funeral mass was attended by hundreds of mourners, including at least one girlfriend of whom I knew. His courage (I write, even though Mark loathed the C-word) touched us all. Most importantly, we all liked and loved him. Mark fought the good fight. He finished the race. Perhaps most remarkably, although he never fully realized it, I think he actually found all that he had been seeking. That”not the loss of virginity”is what truly makes the life of Mark OBrien worth celebrating.